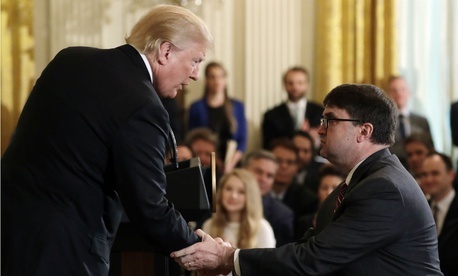 President Trump on Friday announced that he intends to nominate Robert Wilkie to lead the Veterans Affairs Department. Wilkie, formerly the Defense Department undersecretary for personnel and readiness, has been serving as the acting VA secretary since Trump fired David Shulkin from the post earlier this year. Leadership turmoil and a high number of key vacancies at the department have roiled VA at a critical time. This week the House passed sweeping legislation that would overhaul veterans health care, expand vets’ access to private sector care on the government’s dime, and close some of its federally run facilities. The legislation is expected to pass the Senate next week and the president has said he wants to sign it into law before Memorial Day. Trump’s first nominee for the job after firing Shulkin, White House physician Ronny Jackson, withdrew from consideration following multiple reports of poor leadership and mismanagement. Even before Jackson announced his withdrawal, VA Press Secretary Curt Cashour said the “main goal” of the department while Wilkie was serving as acting secretary was to “restore regular order” at VA. While Wilkie’s nomination is likely to run more smoothly than Jackson’s, the fact that he is currently the acting VA secretary complicates matters for the department. Under the Federal Vacancies Reform Act, Wilkie will have to step down from the position once his nomination is formally submitted to the Senate until he is confirmed. Eric Katz contributed to this story.